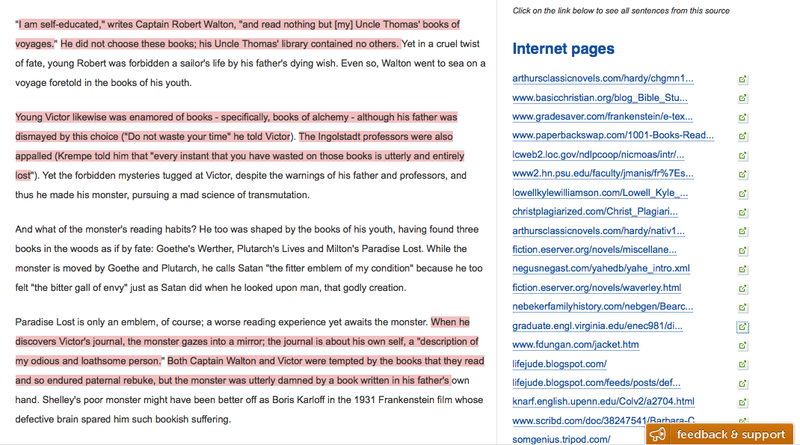 I mentioned in an earlier post how I was really distressed that the main piece of advice circulating on the discussion boards for the course was that people without any special training or understanding of plagiarism should use Plagtracker (or similar) to check on essays. What a terrible piece of advice! There are now quite a few people who are indignant that they are not getting comments back on their work, except for a Plagtracker report telling them that they essay is 20% plagiarized or 30% plagiarized or some such nonsense. I feel so badly for those people - especially because Plagtracker cannot tell the difference between quoted material that is being used specifically for as a supporting quotation and actual plagiarism. So, out of morbid curiosity, I decided to test my own recent essay with the evil Plagtracker (I'm not even going to link to them from here; really, there is no good reason ever to go there). And what happened? My essay is 40% plagiarized! And why? Because it contains four quotes from the novel (Plagtracker ignored two quotes that were just tiny phrases). What does Plagtracker cite as the sources for my plagiarism? My sources are ... Shelley's novel! The source list contains one website after another, each of which republishes the text of the Shelley novel; since the novel is in the public domain, it appears at literally hundreds of websites online. Even worse, for some reason, Plagtracker considers the entire sentence containing the quote to be suspect and highlights it as such. Because I tend to write in long sentences (yes, I have learned to stop worrying and love the semicolon), this means that my quotes from the novel are embedded in long sentences, all of which got flagged as plagiarism, as you can see in the screenshot below. This is exactly what people reported on the discussion boards also: because they included a quotation from the novel, they were deemed "plagiarists" by peer reviewers who were using Plagtracker without any understanding of how to interpret the results. I wish Professor Rabkin had addressed the serious problem of people using this type of software in his statement on plagiarism; it seems to me that no good whatsoever can come of this software - not to mention the ethical problem of putting someone else's writing into a commercial database without their permission. At least I have the right to put my own essay in there, as well as the experience to simply laugh at the results. Równie ciekawie wyglądało sprawdzenie mojego eseju (w języku polskim): Your paper contains 75% of non-unique content that appears in 27 Sources! Własnoręcznie napisany tekst, który nie był nawet inspirowany żadnym istniejącym tekstem (na tyle, żeby można było zasugerować "odpisanie")!
" Cena, jaką musi zapłacić", " Z drugiej strony jest przerażające", "na stałe wniknęła w świadomość przeciętnego". Na szczęście drugi - ciekawszy - esej nt Alicji, był oceniony "tylko" na 15% (choć w 100% własnoręczny). Jest jeszcze jedna rzecz, której nie sprawdzałem, a którą doskonale pamiętam. Swego czasu podobne narzędzie zostało wprowadzone na polskich uczelniach. Ponieważ "Polak potrafi", bardzo szybko znaleziono rozwiązanie - wybrane znaki, zastępowano identycznie wyglądającymi znakami o innym znaczeniu - w wersji drukowanej (dostarczanej do sekretariatu) wyglądało to identycznie, natomiast dla komputera, to były zupełnie inne wyrazy/zdania/akatpity. Np. o (mała literka o) była zastępowana cyfrą "0" (zero) z czcionki, która nie przekreśla zera. Zamiast "Ł" robiono "l" i nakładano na to przekreślenie (/ w odpowiedniej wielkości i położeniu). Jestem przekonany, że i tutaj pewnie obejścia można by zrobić. When I was writing my dissertation, the person at the university who was in charge of reviewing our dissertations and giving the final "go ahead" for graduation was a huge fan of plagiarism software similar to this. She was hoping to fail all students who got over a certain percentage plagiarized. Of course all the faculty put up a big stink and she was eventually nay-said. But just think of the horrors that would have resulted if she'd gotten her way! Ah, I hope not. But if they do I, too, will no longer submit work. I think Turnitin may have been exactly the one that Dr. Chralesworth was trying to force upon us. Software like this ONLY works if people are then willing to double check all the alleged plagiarisms themselves. Because computers simply aren't smart enough (yet?) to distinguish between real plagiarism and "appearances" of plagiarism. Turnitin keeps a record of everything submitted, right? That's a bit dangerous for something like Coursera where one might submit little pieces of something else they've written (which, granted, is self-plagiarism...but is it WRONG in this situation?). Such a mess! DO NOT SUBSCRIBE! Not good! Does not work! Will not let you cancel! Just another think. Turnitin webcrawler is going around on my website... let's block it. They can't use our content to check for plagiarism. Marcin, I read something about the Turnitin robots just the other day - apparently they are really insidious and make it very hard to block - exactly because people are not so keen on giving stuff to Turnitin for their evil profits. They also make good use of Google as well, of course - and since I really do want Google to index my stuff, there's really no way to protect myself from Turnitin. I just focus on trying to remind people at my school how WRONG it is for us to be giving all our students' writing to Turnitin... and paying for the privilege! Argh! I am representative of plagiarism checker Plagtracker. We have created Plagtracker half a year ago and we are still developing our service and making sure that Plagtracker is convenient to work with. 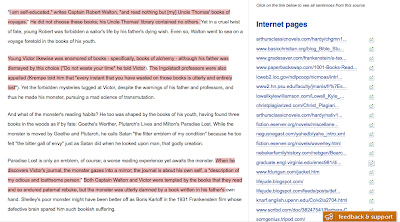 We know that quotes indicate on duplicate content, but it does't accuse of plagiarism! Please, look attentively at Plagtracker report, you'll see "Please make sure that highlighted text is properly referenced." Also, we are planning to create additional feature that identifies quotes. Emilia, I did not say that Plagtracker was inconvenient; making sure that it is convenient to work with does not seem to me really important one way or the other. Your software is completely incapable of identifying actual plagiarism; only a human being can do that responsibly and accurately. So, why do you call your software Plagtracker? In the very name of your service, you give a false expectation about what the software can do. It is NOT capable of "tracking plagiarism" - so why do you give it that name? I just submitted my 500 word essay for the Internet History course and out of curiosity (and because the lecturer suggested it just to cover one's ***) I fed it to the Plagtracker. My secret is that I am too lazy to find any sources to cut-and-paste from - I just write it all off my head. This is possible after having collected years of experience about the subject area (software and engineering in my case). Being lazy also means that my text didn't contain a single quotation which could have been mistaken as plagiarism. Now my essay might be good or it might be bad but I'm sure it would fail the test of my local university due to containing arguments not backed by any reputable references. what i don't get is how the plagtracker report finds, say, 7% of non-unique content in my writing and then "...found in 0 sources..." how can there be a percentage of non-unique content but no source? Basically, both plagtracker and plagspotter are bogus tools developed by a company who has been providing cheating services like "custom written" essays and term papers for students who wanted to cheat their way through their university... Do you see the irony here? hence the result - all they need to "check" is that their "custom made" essay has not been sold to anyone before!